Fueled by environmental awareness & strict government schemes, the global power optimizer market size will depict a robust incline in the years to come, with the adoption of highly-efficient energy-conservation technologies. Driven by the primary agenda of curbing the rate of carbon emissions, commercial & residential sectors across the globe are turning to renewable sources of energy to fuel their daily energy requirements. This has led to a reorientation of industrial focus towards incorporating energy conservation technologies to maximize the energy harvested from a renewable energy source. This is where power optimizers factor in – a module-level power electronic (MLPE) device that continually monitors an energy harvester’s maximum power point tracking (MPPT), it helps to adjust the system’s DC characteristics to optimize energy output. A plethora of ongoing technological developments that are associated with product flexibility, efficiency & operations have also favorably influenced overall industry dynamics. 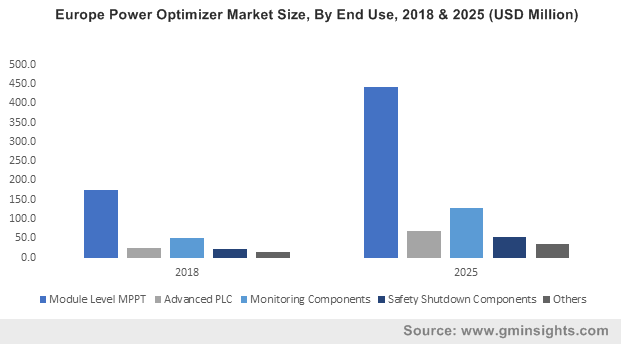 Going forward, sizable upgrades along with variations in different manufacturing practices that are in line with cost-competitiveness would be augmenting the global power optimizer market size. Power optimizers are typically incorporated in solar or wind energy harvesting systems. In solar energy systems, optimizers enable more flexible solar system layouts & designs, with multiple panel tilts, orientations, azimuths & module types. The Europe power optimizer industry in particular, is expected to record sizable growth from the expansion of the renewable energy sector across the continent, which is known for its ongoing renewable energy adoption commitment with a number of nations being world leaders when it comes to fulfilling energy requirements from myriad clean & inextinguishable energy sources. Citing an instance of the aforementioned, the Directive 2009/28/EC, passed in 2009 by the European Council, which promotes adoption of renewable energy sources, states that under the commitment, the EU would be fueling 32% of its energy requirements from renewable energy sources by 2030. Moreover, the region’s energy efficiency directive has also established a detailed framework of measures whose primary agenda is to obtain a 32.5% energy-efficiency headline target by the end of 2030. The directive also makes it an obligation for member nations to accomplish energy savings every year between the year 2021 & 2030 of about 0.8% of the nation’s annual energy consumption. These factors would vividly be responsible for making the European landscape extremely conducive for the growth of the overall power optimizer market in the years to come. According to a report published on Alexandria Engineering Journal, energy conservation obtained through energy efficiency across the building & construction sector has gained unprecedented prominence across the globe. The integration of different renewable energy technologies for several applications is one of the four key aspects for a building to obtain optimal energy efficiency. In fact, the rising trend can be supported by the third quarter 2018 financial results of SolarEdge, a market leader in power optimizers, which claimed that the company shipped more than three million power optimizers in the quarter alone. Moreover, the fact that renewable energy is now relatively cheaper than conventional energy sources like coal would further augment the industry growth. A recent global analysis, where over 6,585 coal-fired plants were evaluated, discovered that it is now more affordable to construct new renewable energy plants than running 35% of the world’s coal-fired plants. By 2030 that number is expected to increase significantly, with renewable energy defeating 96% of the existing & planned coal-fired plants, making it considerably favorable for the power optimizer market to acquire gains from residential applications. In fact, as per estimates, power optimizer industry size from residential applications is anticipated to record annual installations of more than 10 million unit by 2025. Fueled by the increasing adoption of renewable energy across several commercial & residential sectors, the global power optimizer market is expected to traverse alongside a highly profitable growth path over 2019-2025. As per estimates, the overall power optimizer market size is projected to exceed an annual installation of over 30 million units by 2025.